Editor’s Note: This article originally appeared in the Anglotopia Print Magazine is 2017. Support great long-form writing about Britain by subscribing to the Anglotopia Print Magazine. Subscribe here. Books are my favorite souvenir from my travels in England. I love picking up new books about England for my library back home. Each book is a tangible reminder of the trip and where it was purchased. Books are also a very affordable souvenir. Did you know that in Britain, there is no tax on books? That’s right – the 20% VAT rate is not charged on books. That means that most new paperback books cost under £10. If you were to visit a used books store, they would be even cheaper. On a recent trip to London, I was determined to visit some bookstores I had not visited before, visit some old haunts and buy as many books as my trip budget would allow. Stanfords is the first bookstore I visit on every trip to London. 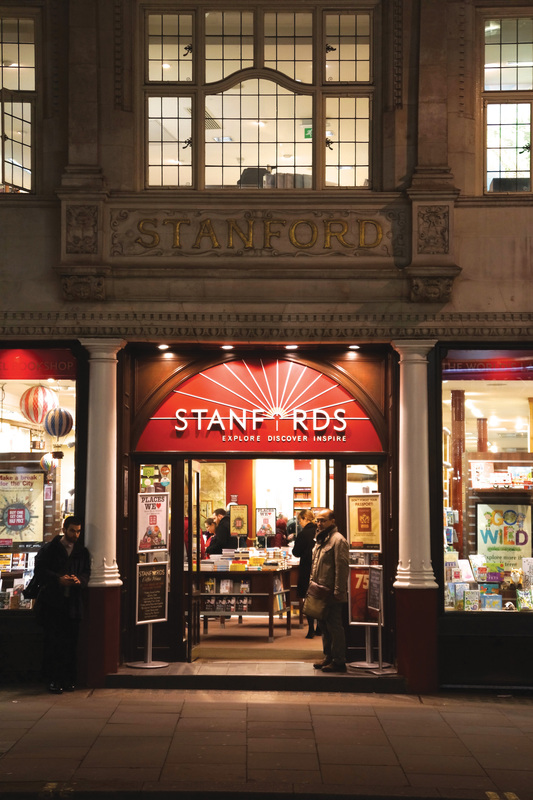 Stanfords is a bookstore that specializes solely in travel – guidebooks, travel writing, maps, etc. My main goal for this visit was to find a very large route planning map of the entire British Isles. My current map on the Anglotopia Office wall is well over ten years old and has seen better days. And while I love this particular map, it now out of print, so I need a new one. Edward Stanford started the store in 1853 as a map seller, and the store expanded from there. It moved to its current location on Long Acre near Covent Garden in 1901. Its stately building is a joy to look at – let alone go inside. Today, every floor of the Victorian building is packed with maps, travel guides and inspirational travel writing; with beautiful hand-made globes and detailed atlases, as well as essential travel accessories for every occasion. The ground floor features best sellers and special offers (and you can often find non-travel related books that are currently popular). There’s also a great section dedicated solely to London related books. There’s often a special buy one, get one-half off sale on the front tables – something I always take advantage of (last year I bought far too many books about British walks). Their British travel section is top notch, and you can find so many lovely books about travel in the UK that you cannot find back home in the USA. My favorite section is the Ordnance Survey Map wall – they literally have every OS map that is printed and a handy guide on how to find the ones for the places you plan to go. OS maps are a must if you plan to do any walking in the English countryside. You can even get custom maps printed in the store while you wait. The other floors are a dizzying array of travel books on every subject you can imagine. There’s the section on travel writing. There’s a section for pretty much every country in the world. If there is somewhere you want to go, Stanfords will have a book and map about it. I found several books that were on my wishlist and also discovered a few more that I didn’t know about – those are always the best treats to find at Stanfords. I also visited the map room. Yes, it’s a room just for buying maps. My goal was to locate a new British Isles route planning map. I went through all the maps in the display cases and was slightly disappointed at first – I could not find one big enough or detailed enough for what I was looking for. And then I found it on the last display. It’s a map from 2013 called the UK Route Planning Map by Map Marketing. It features everything I wanted along with great detail. It will be invaluable for future British trip planning. And it was only £20 – not a bad deal for a rolled map. I purchased about £100 worth of books. See picture above for the specific titles. I also joined their loyalty program which awards points for your purchases. I earned enough on my first go to get £10 off my next purchase or order. Foolishly, I was so excited that I forgot with all my finds that I forgot to ask if I could have everything shipped home. This was a mistake. All the books could not fit in my luggage, so some friends were kind enough to ship them home for me. The bigger problem was the map. The hotel we were staying at, Hazlitt’s, tried to have it sent home but it would have cost something like £40. A ridiculous price for one £20 map. So, to get home, I had to carry the map with me through airport security and keep it with me on the plane. It was worth it though; it’s a beautiful map. In 15 years of travel to London, I had never been to Foyle’s. I know, as a lover of books this is heresy. They recently moved locations to a bigger store further down Charing Cross Road. I finally decided to make my book pilgrimage to this old icon of London books. I was not disappointed. When Christina died in 1999, the store began to modernize and act like a traditional bookstore, much to loyal customers relief (despite those who probably enjoyed the quirks). Foyle’s has also entered the cultural lexicon of Britain – Foyle’s War creator Anthony Horowitz has said that the main character Christopher Foyle is named after the store because the name evoked the 1940’s and the archaic practices of the store. Staff, who used to be fired for no reason and turnover was high, now became experts in their fields and service improved at the store. They have since expanded, opening a few outlets around London and the rest of England. The Charing Cross store is still their main headquarters. When I arrived at Foyle’s, it was a rainy Saturday afternoon, so it was the perfect time to get lost in a bookstore. And boy, did I get lost. As their website says, there are over 200,000 titles in stock in this store. There are six floors of books, divided up by topic area. As someone with particular interests, it was like the store was laid out for me. From the English History section to the travel section to – yes even a special Churchill section. I had no troubles finding books I was looking for and much to my wallet’s dismay, finding new books I hadn’t heard of. They also had shopping baskets handy, which helped as my selection of books got larger and larger. I practically got lost in all the sections related to British history. I was rescued by Mrs. Anglotopia, who found be deciding whether or not to buy certain titles about Churchill. I was particularly impressed with their selection of science fiction. They had a huge selection – not just of current sci-fi hits but also a great selection of back catalog titles. I stocked up on a few titles I had been looking for back home. The kid’s section was also amazing, and I picked up a special book for our children. My only real complaint about the store is that it was very crowded. It was less of a problem as you climbed the staircase and the people started to tail off, but it was hot and stuffy in there. Though it may have just been my excitement. Also, everything is shiny and new. 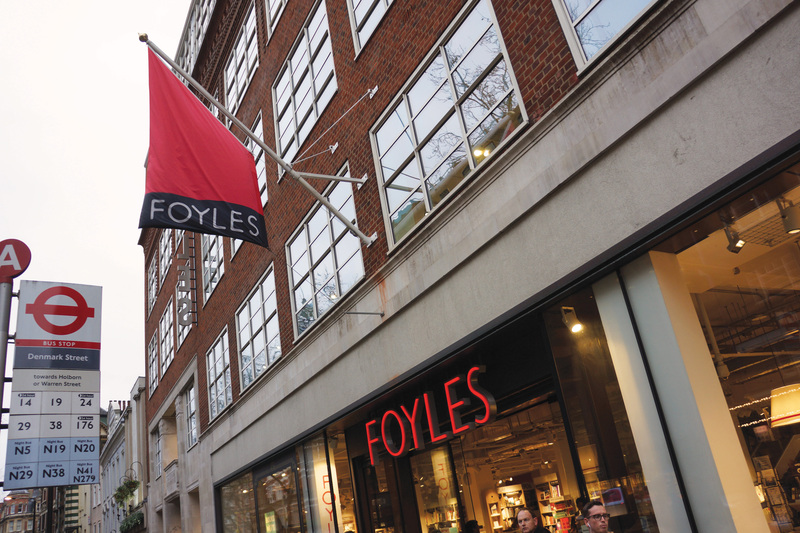 I had heard so many stories about musty old Foyle’s; I was surprised to see that the new shop is so modern and clean. Still, it makes it easy to find everything you’re looking for. When it came time to check out, I could barely carry the basket, so that was my sign to stop and be more sensible. I went to the checkout counter in the history department. This time, I remembered to ask if they could send my books home to the USA. Once again, I’d bought too many to take home in my baggage. They were happy to arrange it – though it cost £40, I bought 20 books in all – so that’s not a bad shipping rate. I also joined their ‘Foyalty’ program, which turns out was a good idea as members got an additional 20% off that weekend, so I saved a ton of money on my, and I’m rather ashamed to admit large purchase. Two weeks after my visit, I was still waiting for them to arrive. When I got home, I wrote their customer service email to find out their status – usually, I would be sent a tracking number or confirmation when something was shipped. I received no reply. I tried to contact them on twitter and also got no reply. I was not very pleased with the customer service at this point. I tried again; this time found the email address for the department where I shipped my books, and I got a quick response that the books had been posted and I should have them any day now. They, in fact, arrived that very day, all in the same condition I purchased them. I liked Foyles very much; I will be back. Located practically next door to Fortnum & Mason’s, Hatchard’s is London oldest bookstore (in fact the UK’s oldest) founded in 1797. It has been at its current location since 1801. When you enter for the first time, it’s exactly how you imagine and old bookstore in London to be – soft lighting, miles of bookshelves, wood paneling and oil paintings. Hatchard’s is famous for their knowledgeable staff. They even have a customized subscription program where they will send you books every month tailored to your tastes. They host many big author-related events throughout the year. Despite its unique character, Hatchard’s is not an independent bookstore and hasn’t been for many years. It’s currently owned by the major bookstore chain Waterstones (and they’ve opened a second location in St Pancras Station ). 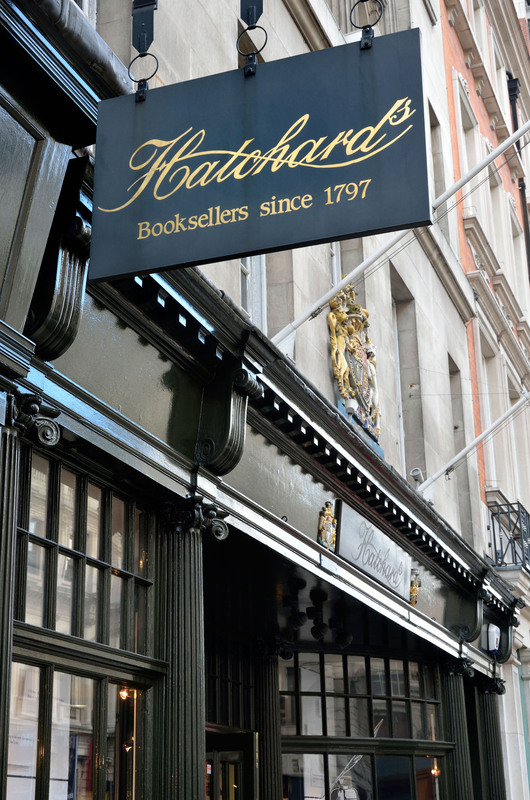 But this store is not like any other Waterstones, it is and will always be Hatchard’s. I have been to Hatchard’s several times and, in fact, I had not planned to visit it on this trip. But as we had a few minutes to kill before seeing a play down the street, we walked by, and I couldn’t resist (Mrs. Anglotopia will agree that I have a bookstore problem). The ground floor is nicely laid out, and I was happy to find their section on British History right near the front. I did not intend to buy too many books because I didn’t want to carry them to to the play. But then I got lost in the bookstore and discovered many more books I did not know existed. I climbed through the multiple floors and kept finding more books. Hatchard’s is a most dangerous place for book lovers. You only live once, right? When I finally went to check out, I had a stack of 10 books, and then their ‘impulse’ books at the counter roped me in, and I threw in several more. This is me showing restraint. So, now presented with a stack of books too heavy to carry to the theatre, I enquired about sending them home, and they were happy to oblige. I paid, they complimented me on my selection, took my details, and I was off to the theatre. I spent £150 I hadn’t planned to when I walked in. Thanks, great exchange rate with the US Dollar, thank you very much. Of all the books I had sent home, these arrived first. It was one week from when I purchased them to when they showed up at my door. They arrived in a Hatchard’s box and were so well bubble-wrapped that all the books arrived in perfect condition. I really appreciated the extra care as airmail can be quite dangerous even to sturdy books. Charing Cross Road has long been famous as the home of London’s bookshops. There was even a fantastic movie about it called 84 Charing Cross Road starring Anthony Hopkins. Time has not been kind to this tradition, and many stores have faded away with time. There’s still quite a few lovely specialist bookstores and secondhand stores to be found, however. I popped into a few since my hotel was not far away. My favorite was Quinto & Francis Edwards who had a lovely mix of antiquarian books and second-hand titles. Its floors creaked like you imagine they should, and there’s a great old book smell to the place. Staff were friendly. I will be back! Also, head down to Cecil Court, which is home to many of London finer booksellers – first editions, signed, and art prints. These are not secondhand stores, and the books you find down this very picturesque street are keepsakes for any library. They’re also expensive. It’s worth walking down this street just to go for a window shop. I’m a huge fan of science-fiction – books and movies. So, Forbidden Planet is one of my favorite stops in London. The first floor features aisles of the latest movie and tv merchandise for all the major franchises. If you’re looking for the latest Doctor Who gear, then this is your place. The bottom floor, however, is book, graphic novel, and comic book heaven. Now, when I’m in London, I try not to buy books that I can easily buy back home. So, exploring a store like Forbidden Planet is more about the spirit of discovery and finding harder to find books. That being said, I managed to find half a dozen sci-fi books that I wanted to take a chance on, several of which I’d never heard of. I was looking for one particular graphic novel – the original Ethel & Ernest by Raymond Briggs (which was the basis of the recent animated film that’s fabulous). I could not locate it amongst the thousands of graphic novels they had. So, I asked at the desk, and it turns out it was the one title they did not have. Still, I was not disappointed with my Forbidden Planet haul. On my way back to my hotel, I wandered the side alleys of Soho in an attempt to learn more about the neighborhood and see what else was around. It was then that I stumbled upon Gosh!, a famous London comic book and graphic novel store that I’d heard of but not yet visited. I popped in to see if they had Ethel & Ernest and sure enough, it was sitting on the main table. I bought that, and only that, showing considerable restraint by not exploring the rest of the very very temptingly cool store. So, that’s my adventures book buying in London. I now have enough new books to keep me busy for the next year or so, many new treasures and many new experiences.